2010 is very much back in the U.S. news. 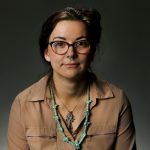 Swedish prosecutors have suspended their investigation against WikiLeaks founder Julian Assange; and the U.S. Army private who was convicted of leaking U.S. secrets to WikiLeaks, Chelsea Manning, was released from military prison. Using the News Dashboard from Trisolute, we did an event analysis (similar to the most impactful news publishers in Google for the 2017 Kentucky Derby) for Manning’s release. We specifically looked at the week around her release on Wednesday, May 17, 2017, and especially the days before and after her release. We will show which news website has the best visibility for a number of factors in the search engine results pages, or SERPS, using a set of 27 keywords listed at the bottom of this post. USA TODAY, the New York Times and the Washington Post are among the front-runners in the different analyses below. If you work in news SEO or coverage major news events online, you’ll want to see who ranked where. The News Dashboard’s mobile KPI Dashboard now features a new report: Mobile Visibility Overall. Using a new feature in the KPI Dashboard, Mobile Visibility Overall, we see the highest visibility for this keyword set was actually the day before Manning’s release, May 16, 2017. This report measures visibility in News Box Headline, News Box Text, NewsBox Carousel, Publisher Carousel and Newsticker. By selecting the USA TODAY data point on May 16, looking specifically at the keyword “chelsea manning” and sorting by Measurement, we see that the article “Chelsea Manning to remain on active duty, receive health care after prison release” ranked in position 1 or 2 for News Box Text – and the News Box it appeared in ranked in position 1 on the mobile SERP – throughout that morning. 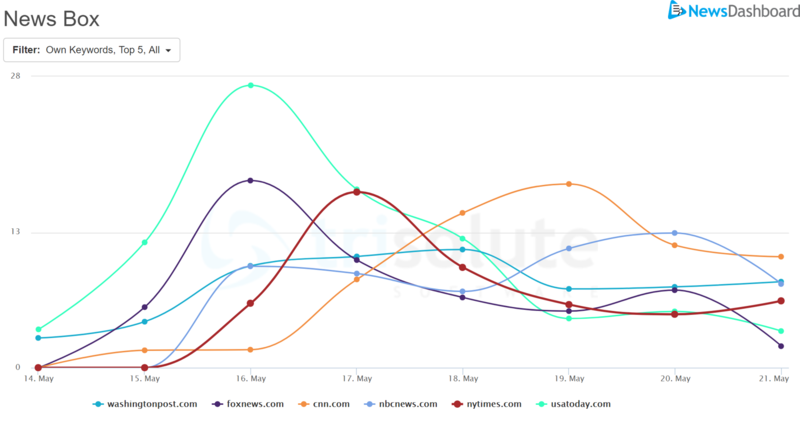 News Dashboard measured the story’s ranking on that keyword every 15 minutes. 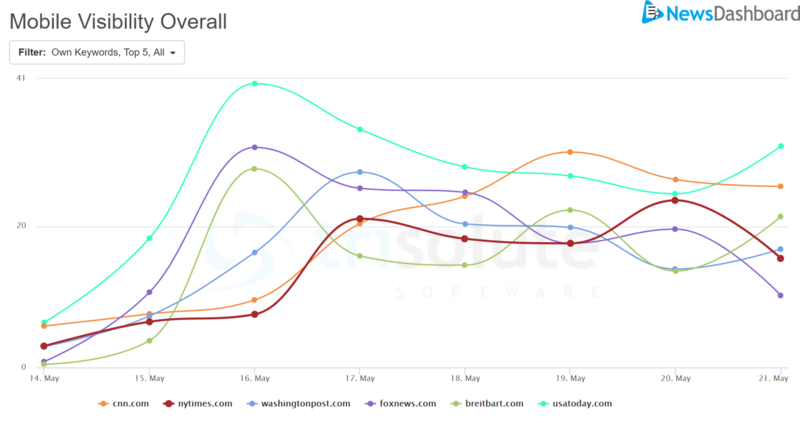 The top 5 news websites that ranked in the mobile Publisher Carousels for Chelsea Manning’s release on Wednesday, May 17, 2017. Drilling down once again on the same report, we looked specifically at visibility in Publisher Carousels about Manning’s release. As Publisher Carousels are created when one news website publishes multiple articles on one topic, making it a habit to create multiple pieces of content about a Google News trending topic might increase the chance of gaining a Publisher Carousel. Legacy news publishers topped the search engine visibility for desktop news boxes for Chelsea Manning’s release from prison on Wednesday, May 17, 2017. Finally, we took a look at the desktop News Boxes using the KPI Dashboard on the actual day of release, May 17. 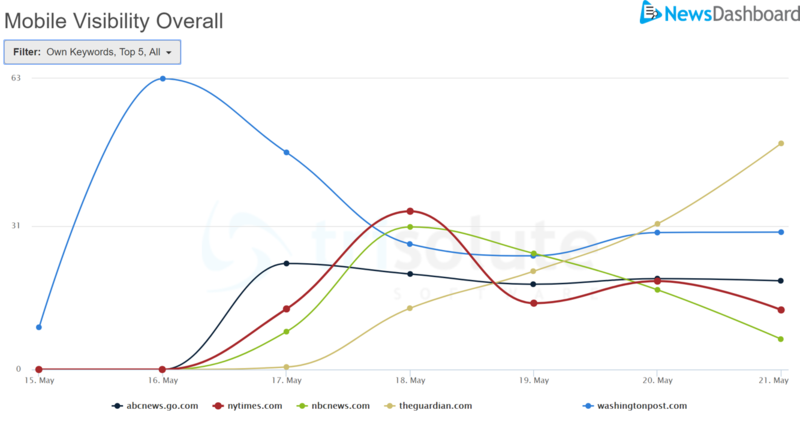 Interestingly, the top 6 publishers landed in pairs at three levels of visibility. Most of the top publishers for Manning’s release – whether in mobile or desktop – are legacy news websites with a history of covering Manning’s case from the first day the leaks broke and through the trial and her pardon from former President Barack Obama.